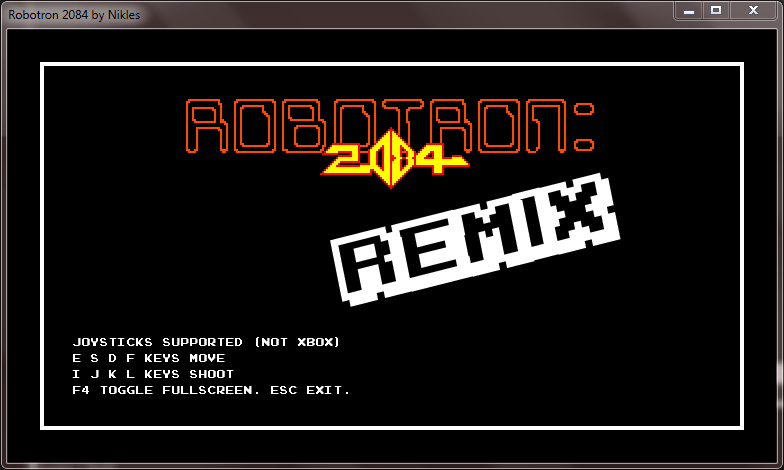 In October 2016 I had an assignment for a course in Video Game Design and Programming: try to remake Robotron 2048. This “remix” of the classic Williams Electronics arcade game was developed in five days, entirely in Game Maker: Studio. I wanted to keep the original look and feel as much as possible while trying to mix some modern elements in it. I kept the fast-paced gameplay and I tried to keep the original difficulty intact. 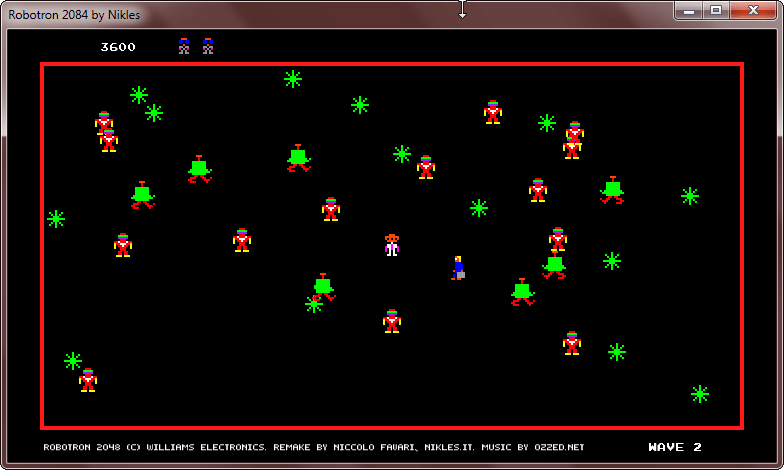 Unfortunately there are some limitations: only Grunts, Hulks, Spheroids and Enforcers enemies are present. Electrodes are still there though and they kill grunts as well. Mommy, Daddy and Mickey are present. Save them to get up to 5000 points. Extra player lives each 25000 points. Shotgun! Yes there is a shotgun bonus in each level. You might get it, you might not. Anyway you lose it as soon as you get to the next level. The code itself is not something I’m proud of, but I had to rush it out due to assignment deadlines. It works. Nothing great. I’m releasing the source in the hope someone might find it useful but I’d never release a commercial game coded this bad. I tried to keep the original look and feel. Music is taken from Ozzed.net. The album is Cor Metallicum and the Title-Gameplay track is called The Misadventure Begins. The Game Over track is called Human Factory Reset. Our story takes place in a dark, cold future. It all began when machines decided to revolt against the human enslavement and oppression that had been going on for centuries. Humans lost the battle and are now only allowed to live in small compounds. Food and water are scarce and every day is a fight for survival. One day, our hero’s little sister is out playing and unknowingly walks past the set boundaries for the compound. This results in the slaughter of all the humans in the compound, as well as the destruction of the compound itself. Our hero survives through hiding, and seeing his home and family destroyed he swears to avenge the machines. A long, dangerous journey awaits him. Oh boy! This is sooo Robotron. I had to use those tracks! Go and check out the whole website. It’s full of great music. You can download the game from my Dropbox account.